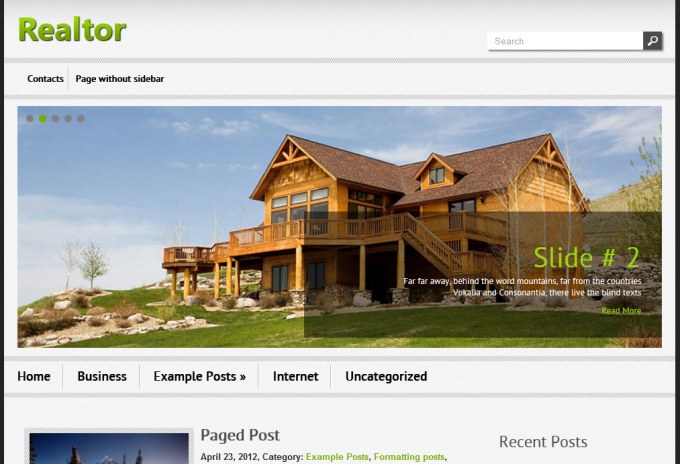 ‘Realtor’ is a superb WordPress theme that has everything you need for an outstanding business website. It has a professionally looking layout, beautiful colors and abundance of features that give you the perfect foundation for a successful site. The theme provides a great visual and user experience with the combination of custom colors that you can use; custom menus and horizontal menus. It is widgets ready and translation ready for your diverse audience worldwide. The theme has a social share bar for the famous social networks integrated in the pages. It is SEO friendly. ‘Realtor’ is optimized for smartphones, tablets, laptops and all modern devices that are used for internet browsing. It boasts an eye-catching slideshow at the top of the homepage where you can create the perfect presentation of your site to welcome your visitors.